CD reviews: "Left of Cool" and "Live From California"
These reviews first appeared in the March 20, 1999 edition of the American Reporter. Just when you give up hope of finding some music to set your soul ablaze, just when you think that corporate America has finally conquered us all in a sea of Kenny G soundalikes, just when you've despaired of ever hearing anything as exciting as your old King Crimson or Miles Davis discs when they were new, along come a couple of albums to restore your faith in, well, righteous weirdness. Bela Fleck started out life as one of the planet's great banjo players. But he quickly expanded beyond the traditional bluegrass and country (and even blues) repertoire, and began combining all the above with jazz and African and Latin and any other ingredients at hand into an incredible, mesmerizing stew, often played on an electric banjo. 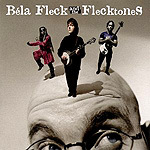 For the past decade, he's headed up his own band, The Flecktones. Sometimes a quartet, more often a trio (with Victor Wooten and Jeff Coffin), the band plays the kind of free-ranging instrumental music that the second incarnation of King Crimson indulged in. At the heart of his music, including his latest disc from last year (on corporate Warner Bros., no less  so much for superficial generalities), remains his impeccable picking: on banjo, mandolin and just about anything else with strings. His latest release is a little more melodic than some of his earlier recordings; less experimental, perhaps  but no less rewarding. If anything, the songs are better than he's done before, more fun to listen to. And he and his band continue to get even tighter in their ensemble improvisation: It's hard work to keep up with them just as a listener. The only weakness here is guest vocalists Dave Matthews and Roy Wooten on a couple tracks: They're a little too breathless, too whispery to fit in with the band's edgy playing; you wouldn't ask Michael Franks to sit in with Buddy Guy, now would you? But them's small taters compared to the overall excellence of this album and some of the finest, tightest ensemble work you'll ever hear. 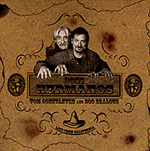 Dose Hermanos is composed of Tom Constanten and Bob Bralove  and they are in a yet-more-distant orbit than even The Flecktones (due no doubt to their long association with The Grateful Dead). Their latest release, "Live From California," shows the two keyboardists still experimenting with sound for sound's sake. They most certainly do not play background music, and at times it can become quite intense with their art-of-noise approach  think of Yoko Ono, only with talent. As do all good explorers, at times they voyage beyond what common sense would dictate. Obviously, not all of it works. But much of it does, and when they're on the mark, it is exciting and exhilarating. Plus, their song titles are a definite nod in the direction of avant-garde guitarist John Fahey: "Scenes of Pagan Iowa," "Shadow of the Invisible Man," "Ganges Valley Brew." Good stuff, fun stuff, worth checking out for those with a wild bent to their ear.